Taking Lives is a pivotal effort to reconstruct the social and political contexts of twentieth century, state-inspired mass murder. Irving Louis Horowitz re-examines genocide from a new perspective-viewing this issue as the defining element in the political sociology of our time. The fifth edition includes approximately 30 percent new materials with five new chapters. The work is divided into five parts: "Present as History Past as Prologue," "Future as Memory," "Toward A General Theory of State-Sponsored Crime," "Studying Genocide." The new edition concludes with chapters reviewing the natural history of genocide studies from 1945 to the present, along with a candid self-appraisal of the author's work in this field over four decades. 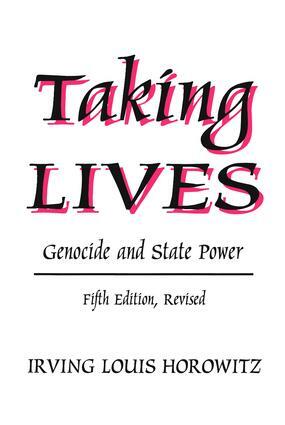 Taking Lives asserts that genocide is not a sporadic or random event, nor is it necessarily linked to economic development or social progress. Genocide is a special sort of mass destruction conducted with the approval of the state apparatus. Life and death issues are uniquely fundamental, since they alone serve as a precondition for the examination of all other issues. Such concerns move us beyond abstract, formalist frameworks into new ways of viewing the social study of the human condition. Nearly all reviewers of earlier editions have recognized this. Taking Lives is a fundamental work for political scientists, sociologists, and all those concerned with the state's propensity toward evil.